A crossword puzzle is a square grid with black and blank squares, containing clue numbers (according to a set of rules) on some of the squares. The puzzle is solved by obtaining the solutions to a set of clues corresponding to the clue numbers. The solved puzzle has one letter in each of the blank square, which represent a sequence of letters (consisting of one or more words in English or occasionally other languages) running along the rows (called “Across”, or “A”) or along the columns (called “Down” or “D”). 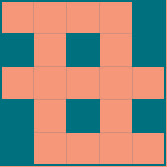 Each numbered square is the beginning of an Across solution or a Down solution. 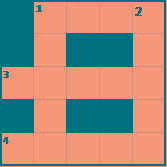 Some of the across and down solutions will intersect at a blank square, and if the solutions are consistent, both of them will have the same letter at the intersecting square. In this problem, you will be given the specifications of the grid, and the solutions in some random order. The problem is to number the grid appropriately, and associate the answers consistently with the clue numbers on the grid, both as Across solutions and as Down solutions, so that the intersecting blank squares have the same letter in both solutions. The first line of the grid part consists of a number, N, the size of the grid (the overall grid is N x N) squares. The next N lines correspond to the N rows of the grid. Each line is comma separated, and has number of pairs of numbers, the first giving the position (column) of the beginning of a black square block, and the next giving the length of the block. 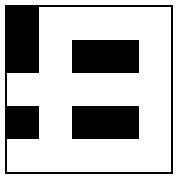 If there are no black squares in a row, the pair “0,0” will be specified. For example, if a line contains “2,3,7,1,14,2”, columns 2,3,4 (a block of 3 starting with 2), 7 (a block of 1 starting with 7) and 14,15 (a block of 2 starting with 14) are black in the corresponding row. The output must be in increasing clue number order. Ifa clue number has both an Across and a Down solution, they must come in separate lines, with the Across solution coming before the Down solution. M=5, and there are 5 (M) solutions. The solutions are fitted to the grid so that they are consistent, and the result is shown below. Note that this is consistent, because the letter at each intersecting blank square in the Across solution and the Down solution. Based on this the output is given in clue number order. 1 Across is ACNE, and hence the first line of the output is 1,A,ACNE. The same logic gives all the remaining solutions. The output can be easily given from this. Note that clue number 1 has both an Across solution (FEAR) and a DOWN solution (FALLS). The Across solution must precede the Down solution in the output.